There are many children who cannot afford to go back-to-school shopping at the mall each fall, so this year the First Congregational Church of Methuen brought the mall to them. What began as an idea over a cup of coffee flourished into a community-wide effort to provide new back-to-school outfits and backpacks to 150 children in Methuen. First Church Congregational, UCC in Methuen (FCC), partnered with the Methuen Arlington Neighborhood, Inc. a local non-profit dedicated to improving the economic and educational levels of low to moderate income residents of Methuen, to bring to fruition a joyous and spectacular shopping day for area children. 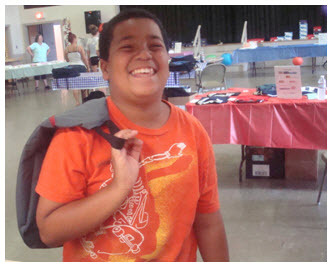 FCC's Outreach Committee, under the leadership of Cynthia Causbie, began by seeking volunteers to apply for grants and to approach local businesses and institutions in an effort to raise the estimated $9,000 needed to provide new jeans, tee shirts, sweatshirt hoodies, underwear, socks, sneakers, backpacks and age-appropriate school supplies for 150 children. Another team was assembled to visit and measure the children for sizes. Armed with a list of sizes by gender, the Back-to-School Committee went to work to organize shoppers who were aggressive bargain hunters and who would not hesitate to inquire on discounts. On Saturday, August 25th, 60 church members and friends were ready! The church's Parish Hall had been transformed into a "mall." When the children arrived with their parents, they were paired with escorts to help them shop at each of the "stores." Then they were given a healthy snack bag for their ride home. At worship the next day, Cynthia commented, "At times during the past few months I was reminded of Jesus taking the five loaves and the two fish and turning to his disciples to distribute food to over 5,000 people. They all ate and were satisfied, with plenty to spare. I know God was watching over us just like He did with Jesus. We not only stretched our resources but the number of volunteers exceeded our expectations. Because of the outpouring of treasures, time and talent were able to multiply our gift to the children." All told, 24 local businesses, hospitals, service organizations and sponsors and over 100 church members and friends of all ages came together to make this undertaking possible. And the children were not the only ones who were thrilled. Volunteers reflected on how they had looked forward to the many nights of fellowship as they gathered to count and sort the clothes and how grateful they were for new friendships. On Mall Day, everyone left with a smile knowing they had truly made a difference in the lives of their neighbors! You can contact Cynthia through the church office at 978-687-1240 or Robertafcc@verizon.net.